The Martynas Mažvydas National Library of Lithuania invites you to watch the visual essay by Swedish artist Ingela Johansson on Gotland Communiqué – a document, signed by Lithuanians from all over the world in Katthammarsvik, island of Gotland, in August 1989, on seeking their united, vital goal − Independence of Lithuania. I. Johanssonis a Stockholm based artist, whose research-based artistic practice often responds to site-specific issues with an interest in social history and collective memory. Her interdisciplinary approach combines various aesthetic strategies and media to create an engaging body of work. In 2016 I. Johanssonreceived The Visual Arts Fund’s 2 years working grant, Swedish Arts Grants Committee, and has previously exhibited at Latvian Center for Contemporary Art, 2018, Kunsthall Trondheim, 2017, Kalmar Konstmuseum, Sweden and Alternativa, Gdańsk, Poland, 2016. 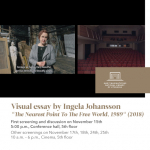 I. Johansson’s particular interest during her research on the independence movement has been the contributions of cultural workers – and especially, of actors from the Youth Theatre in Vilnius – to the Gotland meeting. The exiled Lithuanian artist Eugenijus Budrys was one of the organizers of the study week, together with his closest friend, the architect and freedom fighter Jonas Pajaujis. With her work she tries to fill in the gaps left after rereading and understanding history as it has been officially written. We kindly invite you to participate in the first film screening and discussion on October 15th, 5:00 p.m. at Conference hall, 5th floor. Participants of the discusion: I. Johansson, Prof. Vytautas Lansdbergis, Justas Vincas Paleckis, Janina Matekonytė and Violeta Podolskaitė.